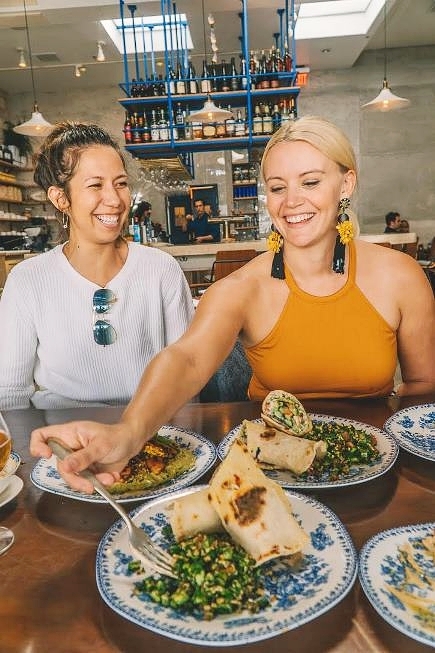 This past week was my friend's birthday and we decided to go to a new Israeli restaurant called Jaffa, located on West 3rd street in Los Angeles. I haven't heard anything but great things about this place so I had to check it out for myself, especially since I love Middle Eastern food. The dishes were excellent and the ambiance was beautiful! It has a modern twist on some old Israeli flavors and they use locally grown ingredients for their spreads and breads! TAHINA-Charred Egglant, Pomegranate, and Pistachios! I have never been to Israel but I can tell you one thing: I am a HUGE fan of their amazing dishes! Not only are the flavors exotic but the spices they use are fantastic! I devoured everything from their plant forward food, "The Market Couscous" to their "Chicken Shawarma Lavash Sandwich". Yummy! I will say however, the service was exactly how you would expect when you're dining in the Mediterranean; laid back and easy. Wondertip: I went at lunchtime BTW so this menu differs from their menu a bit. The Lavash Sandwiches are only offered at lunch. Lunch is better with friends! Pita, Hummus, and their Chicken and Matzah Ball Soup! An inside look at Jaffa!